Took the first pic with my camera phone from where I had lunch the other day. The white building you see there is his Zenon Oil office on Walter Carrington, VI. yes, the yatch has always been there but so many fans of this blog have not seen it before. sure tinubu lives in ikoyi, but so many people don't know the house. lol. Linda your photography skills are wack. Im just kidding. The yatch has been there for a long time girl. Wassup with all the Capt Obvious comments on this blog sef??? R y'all just too dull or do y'all do selective reading??? This post is about her photog skills not how long the yatch has been there. *sigh*....Nigerians. There's still the small matter of 81 billion loan..nice yatch though..bet he had no probs getting away from the floods..
him use am as collateral? I'm more amazed by how many of you don't know how to spell yacht! This isn't even a complicated word to spell Yacht (pronounced yat) and yatch (rhymes with patch, catch, match) shouldn't be that confusing. They are repossessing it Jare. 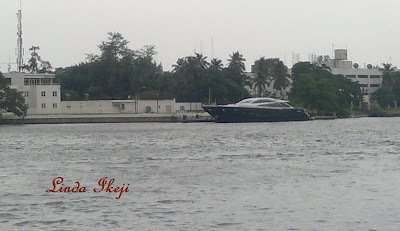 Along with his house in Lagos amongst other assets. The guy doesn't have money again. Let's move on. It has to be one of the most misspelt and mispronounced word in English! The banks should come and take this away to offset all the loans he doesn't want to pay. Linda hope your camera is an SLR? Sorry Linda, that's not a yacht. Yachts are bigger. some are probably trying to catch me out me or probs Linda's(yacth/yatch)..it was a typo jor..written nuff passages on issues that are even more meaningful..English is no brainer to me..talk Science\Technology then we can convo...smh...think its easy writing in a hurry..and multi-tasking on work in the background..
..nothing personal...u know how it goes..
lagos water is shallow and that makes it impossible for him to move the yacht on lagos waters cous the yacht is cone bottom. he already awarded a contracted to Julius berger to dredge lagos waters @ a cost of over #150million.big man! big problem! !